If you are all wondering where I've been and where the second part of my vacation post is, just be assured that all is well. 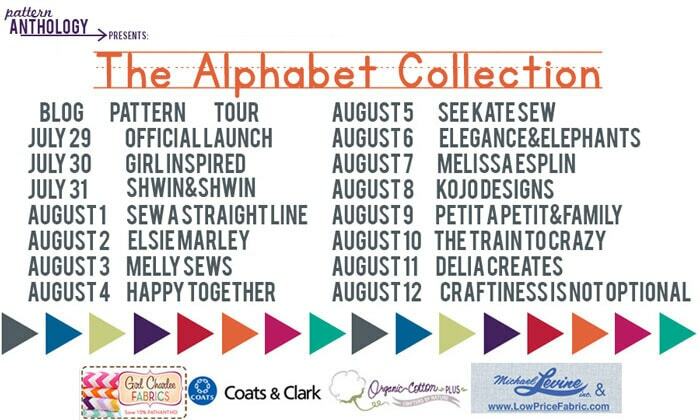 I am just in the middle of completing my collection for the Pattern Anthology- Alphabet Collection blog tour, I am knee deep into sewing, color matching, cutting, figuring it all out! Since I'll only be posting on August 9th, I figured you should know about it, as there are lots of amazing collections coming out and a super special deal- if ever you wanted to get your hands on the patterns, only until next week! So you should have a look and maybe buy your patterns while the special price is on! You could just Click here to visit Pattern Anthology. And if you buy the collection from the link I provided, I get a small commission! My first affiliate link ever, not a bad one don't you think!